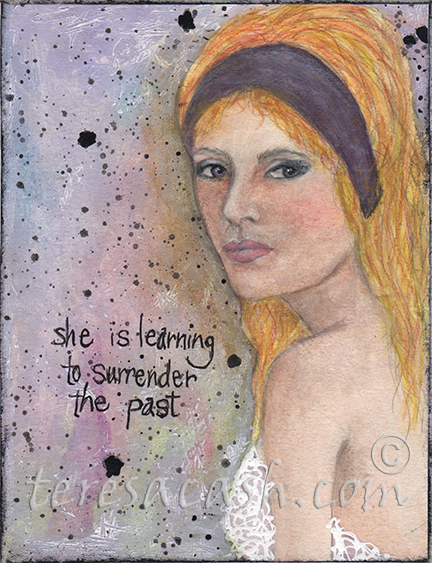 She is learning to surrender the past and live her life in the present. No more looking over her shoulder with doubt, insecurities, and fear that are derived from the past. She may not understand all that is happening in the present moment but she will trust it will all work out OK and the decisions of the present will have a significant impact on the future. Steve Jobs said it best in his 2005 commencement speech to Stanford University. If you haven't heard it before take a moment to listen. "You can't connect the dots looking forward; you can only connect them looking backward. So you have to trust that the dots will somehow connect in your future. You have to trust in something — your gut, destiny, life, karma, whatever." ...believing that the dots will connect down the road will give you the confidence to follow your heart, even when it leads you off the well worn path."